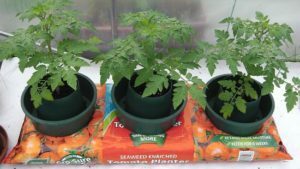 Watering and feeding tomato plants can be a tricky business – especially when they are grown in containers and grow bags. The usual advice is to keep compost or soil “just moist” and not too wet – an almost impossible task – especially on a hot day! The issue is that roots need both moisture and air – not necessarily at the same time – but roots will need air on a daily basis otherwise they will become diseased. The way to avoid the soil being too wet (saturated and air-less) over longer periods is to have a wet/dry cycle. This happens when, after watering, the soil is allowed to almost dry out, which allows air back into the root zone, between the soil particles. Of course if the soil should dry out completely, the plants will wilt. If this happens the fastest way to get moisture into the leaves is by foliar spraying with water. Given that plants need enough water to get them through the day, but also need soil that contains air, here are a few tips for manual watering. Water mornings so that the entire soil area is fully wet – give it a thorough soaking! In the evenings, check to make sure that the soil, an inch or two below the surface, is just slightly damp with your finger. If it is still wet, water less in the morning, if it is too dry, water more. Watering in the evening is best avoided because when temperatures drop at night, plants will be sat in cold water. The problem with watering a little and often when growing in soil, is that water will always find the quickest escape route. This may leave patches or pockets of dry soil beneath the surface. Pro Tip: A drop or two of washing up liquid or a little soap added to water, can be used as a wetting agent (surfactant) but only use a very small amount in the watering can! This is one time when you shouldn’t be generous! Roots in dry soil cannot absorb nutrients. This can lead to nutrient deficiency and result in Blossom End Rot which is caused by calcium deficiency. Irregular watering may also cause irratic growth and irregular fruit size. The stem thickness is a visual aid to the way a tall tomato plant has been fed and watered! You will often hear the words: ” tomato plants need plenty of water”. This is true when plants are mature and fruiting. Giving seedlings too much water can damage their roots. A common issue is over-watering, when air (oxygen) is removed from the soil, which becomes saturated, and roots become affected by disease. A plant with healthy roots will grow more quickly and produce a lot more tomatoes than a plant that has struggled because of receiving too much water and poor root growth. Too much water in the soil can also affect the taste of tomatoes. A watery tasting tom has had a hard time absorbing enough nutrients from the soil. There is also the reservoir method of watering, where pots are sat above a reservoir of water and nutrients. A wick made of capillary matting is used to draw water upwards into the root system. The benefits of this method of watering is that plants are consistantly watered and fed but the soil never becomes saturated. All that is necessary to do, is to keep the reservoir topped-up with water and tomato food. I’ve been using the Quadgrow Planter for several seasons and have always had excellent results. It is great when away on holiday and very reliable as there is nothing that can go wrong – unlike a valve, timer or pipe that can become blocked! Here is a link to more about the Quadgrow Planter system. One way to achieve the wet/dry cycle is to use a Smart Valve. Plants are grown in large pots that are stood in a tray. A valve is placed in the tray and attached to a tank or water container. A certain level of water (2cm for example) is allowed into the tray through the valve. Plants absorb all the water before the tray is refilled to the same level. After the soil in the pots has absorbed all the water in the tray, the valve opens and fills the tray again to the given level. This means that plants are never stood constantly in water because trays won’t refill until after they have run dry. The process also allows air back into the soil – before the tray is refilled. A lack of oxygen in soil slows the growth of plants (respiration grinds to a halt) and they die! That’s what happens when roots are constantly saturated with water. Pro Tip: A great way to improve the moisture/air holding capacity of potting soil is to add perlite. Perlite holds both moisture and air, so it is ideal for keeping roots healthy and plants growing at a consistent rate. The warmer the day – the more water a plant needs. That’s just common sense, but also, take into account the amount of leaves there are. A plant with fewer leaves will need less water than one that has a lot of leaves, owing to leaf moisture loss – one reason why removing excess leaves is a good idea when temperatures are high in mid to late summer. Plants should only be fed with tomato food (Tomorite etc.) when they are beginning to fruit because the nutrient levels of tomato food are mixed for fruiting plants. Before fruiting, it’s normal practice to feed with a grow food or balanced feed up to the time of flowering or fruiting, then switch to a bloom/tomato feed when flowers begin to set fruit. It usually takes around six weeks for tomato plants to use up the nutrients in the soil of a grow bag or newly filled large pot. Therefore, no feed is necessary just after planting because fresh compost already contains nutrients. After the six week period, when feeding becomes necessary, start with a balanced or general feed until the flowers are starting to set fruit, then apply the tomato feed. Of course, plant food is normally applied at the time of watering and most “Tomato Food” manufacturers recommend an application of feed, from once a week to every other watering – depending on the stage of plant growth and whether they are growing outside or in a greenhouse. Every time water only is applied to the roots from above, nutrients are washed away from the top few inches of soil – where most of the fine, nutrient absorbing roots live! This is one reason for the success of the Grow Pot and “Ring Culture”. Plants are fed/watered in the inner ring and watered in the outer ring. This avoids the problem of water only, removing nutrients from around the fine roots close to the stem base. Using Grow Pots is a great way to optimize a grow bag. Pro Tip: Adding perlite will also improve the soil structure and increase oxygen in the root zone. 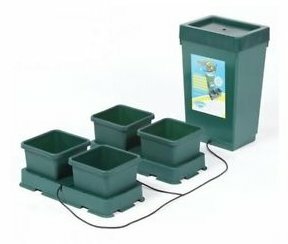 Tips and advice about using grow pots and grow bags. It’s very easy to overfeed tomato plants – especially when they are young seedlings. The problem with feeding young plants is that their roots are very sensitive and may be damaged if fed a solution of feed that is too strong – such as the same strength that a fruiting adult plant would have. If you use good compost (already containing food) there is very little need to feed until the plant is beginning to fruit – assuming that it has been potted-on with new compost. After about four weeks in a small pot the nutrients in the soil will have been used-up, so extra feeding may be necessary if the plant is not potted into a bigger pot with more potting compost. Older plants may show signs of abnormal growth such as growing more leaves and fewer flowers than expected. Leaf curl may also be caused by over feeding. Stress and an increase in the stem thickness. It is possible to block one nutrient by giving too much of another – so my motto is … less is more and if in doubt, don’t! That’s two motto’s! If you feed young plants, do so immediately after transplanting with just half the recommended dosage on the packet (that’s half strength). Tomato plants, until they begin to fruit, should be fed with general purpose plant food (a balanced feed) as tomato food is mainly for the fruiting stage. It’s very easy to become obsessed with feeding tomatoes and how much tomato food to give at each stage of a plant’s growth. Generally, I try to avoid feeding until the fruiting stage … then I will feed at every watering, but at a lower strength than recommended on the box – little and often is the secret. If your tomato plants are in desperate need, foliar feeding is a good way to get nutrients into a plant’s system fast! Be careful to check your box instructions because not all plant food is suitable for foliar feeding. 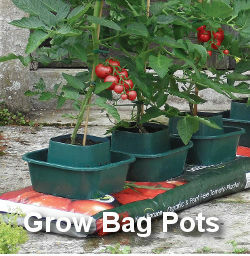 The best way to water and feed tomato plants is by using a Quadgrow Planter or an Easy2Grow Autopot System. 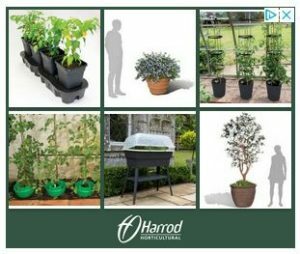 This website is here to encourage people to grow tomatoes and to be good at it too. It’s a great hobby and the taste of home-grown tomatoes makes it very worthwhile!